Managerial economics --- Can it be better? 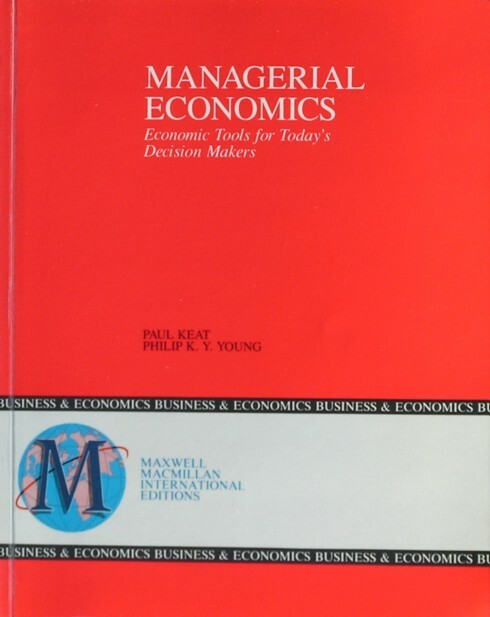 Managerial economics by Paul Keat and Philip Young is a book that perhaps your reviewer ought not to review. For like the subtitle expresses: Economic tools for today's decision makers, the text aims at young people, that want to improve the operating results within their company1. Your reviewer ever bought the book at the second-hand book shop De Slegte, when he aspired after a career at a municipal water supplier, and had not yet become attached to the (political) macro-economics. This purchase was not followed by similar others. So Managerial economics is reviewed here on its own, without a comparison to competing text books. And it must be admitted: the merits of the work are impressive. The pedagogical qualities of the book are excellent. Everything is clear, a statement that is seldom true for other introductory texts. Nothing is self-evident for the writers, and certainly not mathematics. This saves the reader the endless brooding over this single sentence. And that is nice. The lavishly added figures and tables make the text easily accessible. Self-activity is promoted by means of inserted simple spreadsheet programs. And despite the lengthy explanations the volume of 644 pages guarantees that the matter is treated profoundly, and that also advanced themes get a chance. The adventures of the fictitious company Global Foods Inc. take the cake, and are the leading thread that connects the chapters. Each chapter starts with the description of a problem, that confronts the management of Global Food. That immediately stimulates the liking for it. In the final paragraph of the chapter the treated matter is applied in order to solve the problem. And though the management does not adopt each proposal of the advisor, it praises without exception the efforts of the clever assistant. This book can be recommended to the neighbour's son without fear of souring relations. And it is not expensive. Just search at suppliers such as Amazon. It can not fail. The review could end here, but the trusty reader knows that he or she can not get away that easily. Certainly for those with some prior knowledge of economics it is useful to summarize the subjects that are explored in the sixteen chapters. The following grouping can be made: in the two introductory chapters the aims of the firm are sketched. What can be gained? The six following chapters describe the important aspects in relation to the market demand. Then there follow four chapters about the production costs. This ends naturally in three chapters about the setting of the product price. Finally the budget for capital investments is discussed, as well as the role of the government. The introduction about the aims of the firm dives deep into the economic debates. The authors prefer to base the strategy of the firm on the maximization of profit. However they can not escape without mentioning that other goal: the maximization of the wealth of the shareholders. Here a balance must be found between the interest of the firm in the short and long run. This is fascinating matter for everybody, who likes to discuss the financialization of the economic sphere. Evidently there is also the purpose to make a useful product, but this does not really have the highest priority2. The chapters about the operation of markets, the clearing of the market by balancing supply and demand, follow the customary paths3. It reads easily, and clarifies more than many other texts about macro-economics. A word of praise is justified with regard to the explanation of the differences between the short run and the long run, and of the price elasticity. This knowledge can be applied in order to predict the market demand, among other by means of regression models. In the chapters about the production costs Keat and Young get into their swing. This is perhaps the best and most sound explanation of the production functions in the short run and long run, that your reviewer has seen until now. The Cobb-Douglas function is analysed in depth. A similar praise is justified for the successive description of the cost function. Few other book use mathematical polynomials in order to represent the costs as a function of the sale Q, like Managerial economics does. Moreover, as an extra the reader is informed about the secrets of linear programming. Also in the chapters about price setting of products by firms go beyond the usual arguments in average books about macro-economics. This is compulsory matter for everybody, who wants to transcend the idea that the price is the general equilibrium in an economy with full competition. For instance, Keat and Young here discuss the find of firms to charge different prices depending on their target group of consumers!4 And it is so original to relate the model of a markup factor (cost-plus pricing) to the model of marginal pricing. Also the price setting for coupled production is treated. The theory about the budgetting of capital investments is somewhat dull. But also here the arguments of Keat and Young about the net present value and the internal rate of return are digestible without becoming a burden. They are clear and complete. The expositions surpass the text books about engineering economics, that your reviewer possesses, The concluding chapter about state regulations seems a bit lost. Nonetheless, it is inviting, with a description of the deregulations in the branches of banking and airlines. Well, what remains to be said? Reading this furthers an understanding of the world. And it can help to press pretty flowers.